Johannes Franciscus "Jos" Verstappen (born 4 March 1972) is a Dutch former racing driver. After his F1 career Jos Verstappen has won races in A1 Grand Prix and Le Mans Series LMP2 races (winning the 24 hours of Le Mans LMP2 class in 2008). Prior to his F1 debut in 1994, he was also the German Formula Three champion and Masters of Formula Three winner in 1993. Jos was the most successful Dutch F1 racing driver before he retired and started mentoring his son Max in Formula 1. Verstappen began karting at the age of 8, and was participating in national competitions not long after. In 1984 he became Dutch junior champion. He remained successful, and won two European titles. At the end of 1991 he made the transition to car racing. He drove in Formula Opel Lotus, a class in which identical cars compete against each other. He won the European championship in his first year, and got an offer to drive in Formula Three with Van Amersfoort Racing, who also developed other drivers such as Christijan Albers, Tom Coronel and Bas Leinders. During that European winter season, he raced in New Zealand Formula Atlantic. Subsequently, in German Formula Three, he won several international competitions, including the 1993 Marlboro Masters and the German Formula 3 championship. Verstappen first drove a Formula One car when he tested for the Footwork Arrows team alongside Gil de Ferran and Christian Fittipaldi at the Estoril circuit in Portugal. The test took place on September 28, 1993, two days after the Portuguese Grand Prix was held at the same circuit. Despite the large increase in power (from a 175 bhp Formula Three car to the 750 bhp of Formula One), Verstappen set a time that would have qualified him in the preceding race on his fourth timed lap, and improved his time by more than a second after 65 laps. His best lap time of the day was 1:14.45, which was only 0.07 seconds slower than regular driver Derek Warwick had lapped during qualifying, and would have placed him tenth on the grid, a highly impressive performance for a first test. He tested again on September 30 and was lapping near his existing record after five laps, but then crashed the car, ending the test early. After the test, Verstappen was contacted by every Formula One team except Ferrari and Williams, and was eventually signed as the Benetton team's test driver for the 1994 season. After a crash in pre-season testing by regular driver JJ Lehto (who broke a vertebra), Verstappen drove in the first two races of the season as a substitute, partnering Michael Schumacher and made his Formula One debut at the 1994 Brazilian Grand Prix. During the race he collided with Eddie Irvine, which triggered a multiple accident also involving Éric Bernard and Martin Brundle. Verstappen's car somersaulted, but he emerged unharmed. At the Pacific Grand Prix Verstappen ran 6th but spun off on cold tyres immediately after a pit stop. Lehto was fit for the next race at Imola, but his performances in subsequent races were disappointing and he was rested by Benetton following the Canadian Grand Prix, allowing Verstappen to return to the race seat. One of the most dramatic incidents affected Verstappen at the German Grand Prix. During his first scheduled pitstop during the race, fuel leaked onto the car after the fuel hose was disconnected. The car, with Verstappen in it, was engulfed in flames for several seconds. As was usual at the time, Verstappen had slightly opened the visor of his helmet for the pit stop, but apart from slight burns to his nose, he was uninjured. After this incident the fuel delivery hose was modified to incorporate a fail-safe cut-out system. Jos Verstappen driving the Benetton B194 at the 1994 British Grand Prix. A high point in this season was Verstappen's third place during the next Grand Prix in Hungary, Schumacher having allowed Verstappen to unlap himself on the final lap to pass Martin Brundle's stricken McLaren-Peugeot. He took another third place at the Belgian Grand Prix due to Schumacher's post-race disqualification from victory, and a fifth place at the Portuguese Grand Prix. A curiosity was his accident during a practice session for the French Grand Prix at Magny-Cours, in which Verstappen rammed his car into the pit wall causing debris to fly up and destroy a TV installation. Due to this accident, this equipment is now protected from the race track by acrylic glass. For the last two races of the season, Verstappen was replaced by the more experienced Johnny Herbert in a bid to win the Constructors' Championship for Benetton - which failed, but in the end Herbert was signed for the 1995 season instead of Verstappen. The team was unsuccessful in this aim and the prize went to the rival Williams team. In 1995 he was loaned to Simtek by Benetton team principal Flavio Briatore. Despite some strong showings (including running 6th at the Argentine Grand Prix before a poor pit stop and subsequent gearbox failure) Verstappen only finished once in the five races he drove for the team due to technical difficulties. The team had deep financial troubles and went bankrupt after the Monaco Grand Prix. Out of a race drive, Verstappen did some test driving with Benetton and Ligier (then part-owned by Briatore and Tom Walkinshaw). Briatore decided against taking up his option for Verstappen in 1996, signing Jean Alesi and Gerhard Berger to drive instead. In 1996 he drove for the Footwork team and impressed in the early rounds, running 5th in Interlagos and finishing 6th in Buenos Aires. Shortly after the team was taken over by Walkinshaw's TWR organisation. During the Belgian Grand Prix a part of the suspension of Verstappen's car broke off, causing him to crash heavily. He ended up with a prolonged neck injury. Initially Verstappen featured strongly in Walkinshaw's plans for 1997 (the new owner at one point threatening to replace him with a pay driver unless he signed for another season) but the surprise availability of Damon Hill (soon to be crowned World Champion) saw him dropped instead. His form in the second half of the season dropped off as development on the 1996 car ground to a standstill, TWR Arrows focusing instead on 1997. In 1997 he went to the Tyrrell team but did not score any points, though he briefly ran 5th in the Canadian Grand Prix. The team suffered from an underpowered Ford Cosworth EDV V8 engine and a lack of funding leaving Verstappen and teammate Mika Salo struggling towards the rear of the field. Verstappen's best result for the team was 8th at the wet Monaco Grand Prix. Before the 1998 season Tyrrell were sold to British American Tobacco, who intended to rebrand the team as British American Racing in 1999 after one final season under the Tyrrell banner. Ken Tyrrell wanted to retain Verstappen alongside Toranosuke Takagi but BAT insisted on taking pay driver Ricardo Rosset alongside the young Japanese driver. Tyrrell himself left the team in disgust over the matter, leaving Dr. Harvey Postlethwaite to run the team. Out of a regular drive for 1998, Verstappen tested for Benetton once again early in the year, but the team would not hire him as a permanent test driver for lack of sponsors. As an experienced, fast free agent Verstappen was a common name mentioned in pit lane gossip as a replacement for underperforming drivers. He would eventually return to the series at the French Grand Prix, replacing Jan Magnussen at Stewart. However, the car was uncompetitive, the team struggled to run two cars to the same level and Verstappen did not perform significantly better than his predecessor. Johnny Herbert was signed to partner Rubens Barrichello for 1999 and Verstappen was left casting around for a drive again. However, for once it looked like things were going in the right direction for Verstappen. Near the end of 1998 he became the test driver for the Honda Formula One project. He teamed up with old Tyrrell friends Rupert Manwaring and Harvey Postlethwaite, planning to test the new car in 1999 and join the series in 2000. All went well for the operation, with the testing hack showing well against upper-midfield teams such as Benetton and Williams in various test sessions until Postlethwaite died of a heart attack. Not long after, Honda changed their plans from becoming a fully factory team to just an engine supplier and Verstappen was again without a Formula One seat. He tested for the Jordan team in case Damon Hill decided to retire before the end of the season but this came to nothing when Verstappen's testing performance was underwhelming and Hill resolved to see out the season. Verstappen testing for the Arrows team at the Monza circuit in 2000. In 2000 he returned to Arrows, who had put together an impressive package including Supertec engines, a neat chassis with good straight-line speed and a bevy of sponsors. The car proved to be unreliable but its speed allowed Verstappen and teammate Pedro de la Rosa to dice with the front runners at several circuits (albeit partly due to the design's small fuel tank meaning the cars were often lighter than their rivals). In his second race back at Interlagos he ran 6th before spinning due to a sore neck brought on by his lack of recent seat time. In the wet/dry Canadian Grand Prix, he drove superbly in the later stages to move into a strong 5th position and score his first points since 1996. After the first corner accidents in Austria de la Rosa and Verstappen ran 4th and 5th but mechanical problems sidelined them both. Verstappen would score only once again, a strong 4th place at Monza. For 2001 he was retained by Arrows. The Supertec engines were replaced by Asiatech units and de la Rosa was dropped on the eve of the season in favour of the Red Bull-backed Enrique Bernoldi. The package was more reliable but less competitive and Verstappen was hurt on occasion by indifferent qualifying form (often lining up behind his rookie teammate on the grid). Highlights of the season included running 2nd at Sepang having started 18th, making a superb start and running well in changing conditions before dropping to 7th and later scoring the team's only point of the year for 6th at the A1-Ring. Less impressive were his performances at Interlagos, where he ran into the back of leader Juan Pablo Montoya just after being lapped and Montreal where he moved into the top 6 but asked too much of his brakes and crashed out on a day when points were possible. Nevertheless, he had re-signed to drive for Arrows in 2002 only to be dropped at the eleventh hour in favour of Heinz-Harald Frentzen. Later that year he almost signed a test contract with Sauber but he turned out to be physically too large for the car, which was smaller than its predecessor. He returned to the cockpit in 2003 with Paul Stoddart's European Minardi team, considered the tail enders of the grid. With limited funds and underpowered engines it was a difficult season with little opportunity to shine. His best result was 9th at the Canadian Grand Prix, one place away from a point under the new scoring system. At the Brazilian Grand Prix he had been running ahead of eventual winner Giancarlo Fisichella on the same strategy only to spin off on standing water, but generally the year was one to forget – and many noted that Verstappen was largely outperformed by rookie teammate Justin Wilson. At the end of the year he left the Italian team because he did not feel like driving in the rear-guard for another year. Out of a drive for 2004 Verstappen was considered as a replacement for Giorgio Pantano at Jordan partway through the season but was unable to fit in the car and began looking for drives outside Formula One for the following season. Verstappen participated in 107 Grands Prix. He achieved two podium places, and scored a total of 17 championship points (115 in the modern system) which makes him the second best performing Dutch driver in Formula One to date, beaten only by his son, Max. Jos Verstappen's highest qualifying position was 6th, at the 1994 Belgian Grand Prix. Verstappen driving for A1 Team Netherlands. After two years of not participating in races, Verstappen was confirmed in July as driver of the A1 Team Netherlands managed by seatholder Jan Lammers's Racing for Holland, for the A1 Grand Prix series. They won the feature race at Durban. On 27 September 2006, Verstappen split with A1 Team Netherlands after failing to secure payment guarantees. This resulted from Verstappen only being paid for the 2005/06 season a few weeks before the next season started. He was replaced by Jeroen Bleekemolen for the first race of the 2006/07 season at the team's home race at Zandvoort. 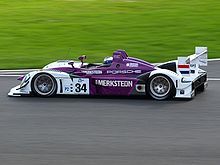 Verstappen driving for Van Merksteijn Motorsport at the 2008 1000km of Silverstone, in which he and teammate Peter van Merksteijn Sr. won the LMP2 class. In December 2007, Verstappen announced that he would take part in the 2008 24 Hours of Le Mans race, as well as enter the 1,000 kilometre races in the Le Mans Series. Driving a LMP2-class Porsche RS Spyder fielded by Van Merksteijn Motorsport, Verstappen was partnered by team owner Peter van Merksteijn Sr.. Jeroen Bleekemolen also joined the team for the 24 Hours of Le Mans race. After winning the 1000km Catalunya and 1000km Spa, and finishing second in the 1000km Monza, Jos Verstappen won the LMP2 class of the 2008 24 Hours of Le Mans. With his victory at the 1000km Nurburgring, Verstappen clinched the LMP2 Drivers' title and Van Merksteijn Motorsport won the LMP2 Manufacturers' title. Verstappen participated in the 2009 24 Hours of Le Mans in a Lola-Aston Martin. In 1996, Verstappen married Belgian ex-kart driver champion Sophie Kumpen, whose cousin is NASCAR Whelen Euro Series racing driver Anthony Kumpen, and whose uncle is former motocross and GT endurance rally driver Paul Kumpen. Verstappen and Sophie Kumpen have two children, Max (b. 1997) and Victoria (b. 1999), both of whom have gone on to become racing drivers. During his professional career, Verstappen was nicknamed "Jos the Boss" and "Dutch Devil". Equipe Verschuur Peter van Merksteijn Sr.
^ "Jos Verstappen". grandprix.com. Retrieved 20 August 2014. ^ a b c d e f g h i j k l m n o p q r s t u v w x y z aa ab ac ad ae af ag ah ai aj ak al "Dutch courage: the unfulfilled promise of Jos Verstappen". 8W. Retrieved 19 August 2014. ^ Hallbery, Andrew (2009-12-03). "Remembering 1993's F1 young driver test". autosport.com. Haymarket Publications. Retrieved 2009-12-04. ^ "From The Archive: Jos Verstappen, debut F1 test, Estoril, September 28, 1993". Autosport. 198 (10): 93. 2009-12-03. ^ "Jos Verstappen". f1db.com. Archived from the original on 2007-10-10. Retrieved 2007-08-18. ^ "1994 – All Teams". www.formula1.com. Archived from the original on 23 February 2015. Retrieved 20 August 2014. ^ a b "Jos Verstappen". Archived from the original on 22 August 2014. Retrieved 20 August 2014. ^ a b "Flavio Briatore – The Years of Living Dangerously Pay Off in 2005" (PDF). BusinessF1. 14 December 2005. Retrieved 20 August 2014. ^ "Risky Business The TWR Arrows Years 1996–2002". F1 Rejects. Archived from the original on October 12, 2013. Retrieved 20 August 2014. ^ "Jos Verstappen". StatsF1. Retrieved 20 August 2014. ^ "Grand Prix Results: Austrian GP, 2000". grandprix.com. Retrieved 20 August 2014. ^ "Grand Prix Results: Italian GP, 2000". grandprix.com. Retrieved 20 August 2014. ^ a b c d "Constructors: Arrows Grand Prix". grandprix.com. Retrieved 20 August 2014. ^ "Data Search Results". ChicaneF1. Retrieved 20 August 2014. ^ "Grand Prix Results: Brazilian GP, 2001". grandprix.com. Retrieved 20 August 2014. ^ "Grand Prix Results: Canadian GP, 2001". grandprix.com. Retrieved 20 August 2014. ^ "Sauber in the spotlight". grandprix.com. 2002-07-29. Retrieved 2007-08-18. ^ "Jos Verstappen will not be driving for Minardi". verstappen.nl. 2003-12-18. Retrieved 2007-08-18. ^ "Verstappen cancels Jordan test". motorsport.com. 26 May 2004. Retrieved 20 August 2014. ^ "Verstappen focused on 2005 season". gpupdate.net. 18 August 2004. Retrieved 20 August 2014. ^ a b c d "Jos Verstappen". ChicaneF1. Retrieved 20 August 2014. ^ a b "Jos Verstappen". gpupdate.net. Retrieved 20 August 2014. ^ "Manager: don't blame Verstappen". Autosport. 30 September 2006. Retrieved 20 August 2014. ^ "Jeroen Bleekemolen replaces Jos Verstappen for A1 Team Netherlands". automobilsport.com. 27 September 2006. Retrieved 20 August 2014. ^ "Verstappen to miss opener". www.crash.net. Retrieved 20 August 2014. ^ a b "Verstappen to race at Le Mans". Autosport. 27 December 2007. Retrieved 20 August 2014. ^ "Van Merksteijn Motorsport wins LMP2 team title, Jos Verstappen drivers' champ in Le Mans Series". Grove Sports Management Group. 17 August 2008. Archived from the original on 21 August 2014. Retrieved 20 August 2014. ^ "Le Mans: Aston Martin signs Verstappen, Davidson for 24-hour race". Autoweek. 21 May 2009. Retrieved 20 August 2014. ^ Meens, Stefan (22 October 2014). "Happy Birthday Victoria!". verstappen.nl. Verstappen Info Page. Retrieved 2014-11-03. ^ "Verstappen in court on assault charge". autosport.com. 2008-12-09. Retrieved 2008-12-09. ^ "Jos Verstappen avoids jail over wife assault". duemotori.com. 2009-01-07. Retrieved 2009-01-30. ^ "Verstappen found guilty of assault". BBC News. 30 October 2000. Retrieved 2008-12-09. ^ "Jos Verstappen mishandelde vriendin" (in Dutch). Privé magazine of De Telegraaf media group. 29 November 2011. Retrieved 2011-11-29. ^ "Verstappen facing fresh assault charges". TotalF1.com. 5 January 2012. Archived from the original on 18 December 2012. ^ "F1 : Former Formula 1 racer Jos Verstappen released from Dutch jail on Friday". F1sa.com. Archived from the original on 2012-01-22. Retrieved 2012-01-20. ^ "7 things you didn't know about Max Verstappen". bbc.co.uk. 20 August 2014. Retrieved 8 December 2016. ^ "SportToday.org". Retrieved 8 December 2016. Wikimedia Commons has media related to Jos Verstappen. This page was last edited on 17 April 2019, at 00:07 (UTC).